In our journey to master email marketing, we will now focus on the elements of a high-converting email. You must work on optimizing each and every one of these elements. All the strategies we describe later in this guide will use the elements we discuss in the current chapter. Let’s try to understand the vocabulary of email marketing. In this section, we will introduce the basic building blocks of a marketing email. We will also discuss their significance for your email marketing campaigns. Each of these below paragraphs also contains ways to optimize the corresponding email marketing element. As a marketer, these terms will help you understand what email marketing is all about. The subject line of an email can make or break your email marketing strategy. An email recipient reads this text first and decides whether he/she will open the email. It is one of the only two things standing between the customer and the email content. It also forms the start of your email copywriting theme. All the different parts of your email should speak as one single element with the customer. It means - they all should communicate a single benefit. Putting too many benefits in your email may distract the user away from the goal of your email i.e. to click your CTA. Should help the customer build a personal connection with the brand. Should match the intent of your email content i.e. there should not be a vast difference between what the customer reads in the subject line and what he gets in the email content. Should offer a clear value proposition that solves a common problem for the customer. Should use action words like “buy”, “download”, “join now”, and so on. Technically, these are commands in the English language. Humans can process these commands quickly as they offer the least resistance path to understanding. Can include customer’s name, business industry for personalization. Be sure not to overdo this as it can lose it effect quickly once the customer builds up psychological resistance to such techniques. 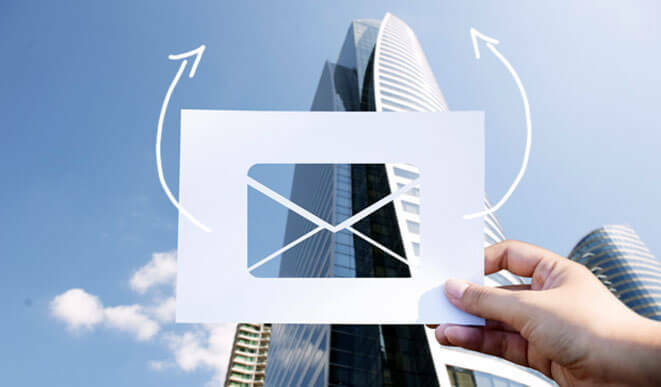 A humanized sender name is an underrated tool; it is very effective in building a direct, personal connection with users through email. Its significance increases even more in a modern age where users are immune to automated marketing messages from bots. People love to talk to people, not robots. A user will decide on opening or ignoring the email by looking at the name of the sender and the subject line of the email. 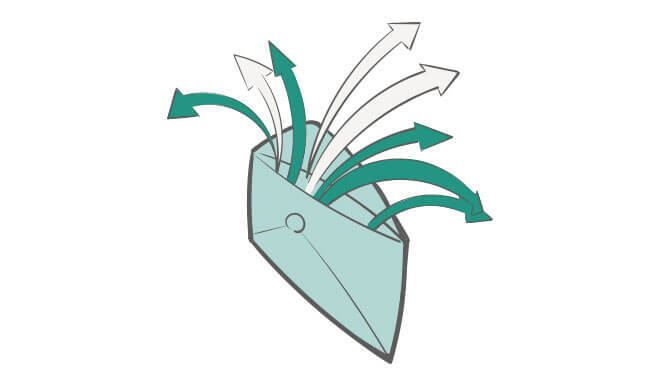 A human sender’s name in the email “from” field helps build trust between the subscribers and your brand. Gradually, as users begin to open your emails and find value consistently, your sender name gets associated with "good content" in their heads. Once that connection gets solidified, they will open your emails almost automatically, every time. This doesn’t mean you should use only one name. Sometimes the author of the article or ebook being offered in the email works better. Other times, CEO of the company becomes the face and helps subscribers form a positive association with your brand’s name. Your company’s PR team should be able to gauge the right name to be the face of your organization. If you do not have the resources for a PR team, you can test a few different sender names by using A/B tests. Every subscriber wants something new every time. This gave content marketers a free pass to serve whatever content they could come up with. However, not all creativity is equal. In an effort to be different from other brands and to serve unique content, many brands often come up with irrelevant content. This is the result of not making your email content relatable for the subscriber. Understanding the problems of the customer and helping them solve these problems should be the central purpose of your email campaigns. Irrelevant content comes up when you don’t talk about customers problems in your email. The first and the most important level of personalization is to talk about what is relevant to the subscribers. You can make your content even more relatable by writing it according to "buyer personas". A buyer persona is a set of characteristics of different audience segments in your email list. It enables you to understand what the customer really likes. Talking about problems relevant to your leads is the first level of personalization. Talking about them in the way they want to talk about it is the second level of personalization. You can get the customer to answer the first two in the first opt-in form when they subscribe. It may also be collected progressively on frequent visits. Knowing what the customers want to do is not be a straightforward question. The customer won’t tell you these details directly. You have to mine it out by monitoring their activity on the site. Marketing analytics can help you achieve a great deal more of personalization too. Caring about who the subscribers are and what they want to do helps brands make mass marketing less robotic and more personal; it enables them to do personalized marketing. Even your best offer may be ignored by the customer if it is written in a plain language. This is why most marketers are trying to find out new and exciting ways to deliver their message. It has created a new role in the marketing teams; a copywriter is employed to create text that achieves higher conversion rates. Of course, the first requirement is that your offer and its value proposition has to be crystal clear. Use of jargon or obscure words from the thesaurus is the biggest disservice you would do to your email campaign. If you see a rarely used word, head over to thesaurus.com to find a simpler, more commonly used alternative. Use bullet points instead of a long comma-separated list. For example, this list has only 3 elements but we have used it to break the blocks of the text on this page. Use images to convey your point. Don’t overuse them, though. The third and the final requirement of a good email copy is compelling language. Your emails have to be short, interesting, and engaging. Use empathy, put yourself in the shoes of your customer and think about how your tool/service helps them solve a problem. In summary, a clear, concise, and compelling email copy is the hallmark of a high-converting email. Your email is a special piece of communication; your subscribers love reading it. Having this assumption is detrimental to your email campaigns. Emails are constantly changing and evolving. As the need for personalization grew, brands started monitoring their subscribers’ activity. Personalization became a major problem, that is being solved by many marketing automation companies. Images too need some level of personalization. Random stock photography is not so easy to obtain but it is cheap. As it is free / cheap, it is also generic and not specific to what you are talking about in your email. Everyone who is seeing the image can use it; there is no exclusivity or brand appeal about it either. Besides, most stock photographs don’t exactly match your purpose statement for the graphic. It could easily become irrelevant. Hiring a decent graphic designer is the only way to ensure authentic, unique, customized, and highly relevant images. 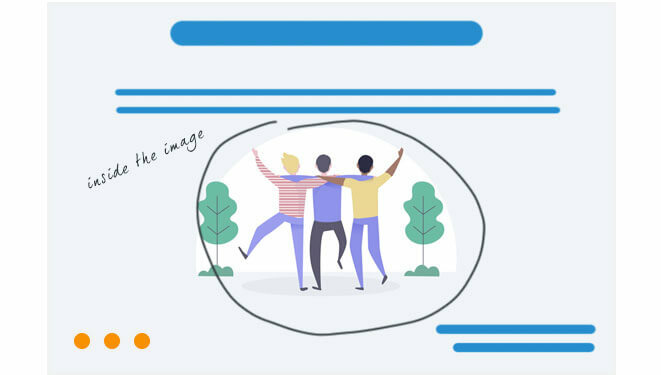 Images that match the content help enhance the overall value of the email. They can help you convert better. It could be a proof of the offer or your product. You can also include client testimonials through images in your email, thus providing social proof to the client. An image can also act as a supplement to the text of your email. 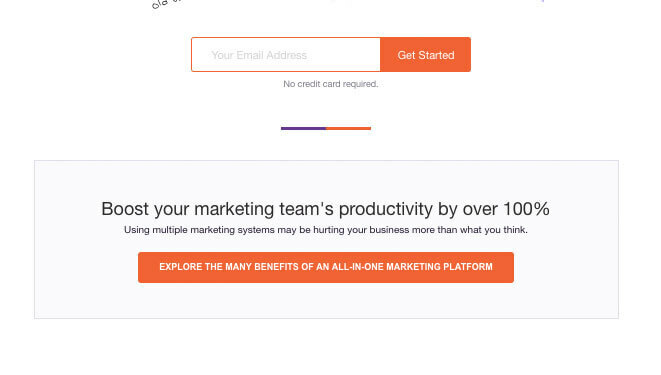 A call-to-action is a simple text that is placed on the “Click Here” button on your email. It’s job is to entice the user to visit the page, avail the offer or visit your blog – it can lead the visitors anywhere you want. It’s the gateway to a whole world of possibilities. This is why it is so crucial for an email to have an engaging CTA text. There is no hard and fast rule for placement or number of CTAs in an email. It depends on the design and the length of the email. The CTA has to be based on one single benefit; cramming too many benefits into one CTA only makes it awkward to read. The text and the CTA work together. So, CTA must have related content around it that inspires the users to click it. First, it helps nurture current leads and convert them into customers. Second, it also helps generate new leads. To achieve the second objective, you have to encourage your current readers to share your content within their own networks. Social sharing buttons inside the email make sharing easy; the user does not have to visit to the website. This expands your reach to people who are not your subscribers. It opens up a new channel to capture fresh leads. Optimize these social links by including sharing buttons for all the major social networks used by your subscribers. This covers Facebook, Twitter, LinkedIn, and Pinterest. We also encourage our readers to include Reddit as it is also a hugely popular network. You must also include an email forward button. For the best results, design it separately from other social sharing buttons. Your emails can also improve your brand's awareness. Your email copy should thus include two calls-to-action. One will be for the primary purpose - to click through email and move the subscriber to the landing page/blog. The second will be a customized social sharing CTA. By adding text that is directly relevant to the customer benefits, you are increasing the chances of your content being shared. Mobile usage statistics will show you just how important the mobile medium is. It has been more than a decade since people started reading their emails on their mobile devices. Nobody likes sitting on a desktop machine to check their emails anymore. Your subscribers shouldn’t have to miss out on your content just because they are on a mobile device. Your emails should be displayed smoothly, with zero glitches across all the myriad types of devices in use today. Mobile devices are not just limited to smartphones. There are all sorts of devices being used for consumption of content online. There are 5” inch screens and larger phones go up to 6” inch screens. Some phones also have high screen resolution, even with a small screen size. Tablets come in a wide variety of sizes. People are also using personal-sized laptops on the go for checking their emails. If the emails are not tested for different screen sizes, they may become distorted to the point of being illegible. It may leave your subscribers frustrated with your content. It won’t be long before they click the unsubscribe link. The best way to overcome the problem is to use mobile-optimized templates. Most email marketing providers include modern mobile templates which are also conversion optimized. Fortunately, no one ignores the need for mobile optimization; there are a lot of solutions out there. However, if you are looking for a new email marketing provider, you should closely inspect their mobile optimization capabilities. Any provider not including this facility should not even be considered. It is legally mandatory in EU countries to include an unsubscribe link. Recall that open rates and click-through rates are calculated based on the total number of subscribers on the list. If there are dormant subscribers who don’t interact, it drives down your open and click-through rates. Therefore, it’s better to let people stay on your list only if they want to. Another reason to include an unsubscribe link is that if the user can’t find one, he may just mark your sender email address as SPAM. This is way worse than inaccurate open and click-through rates. This affects your email sender reputation, and so is an indirect threat to your future email marketing campaigns. There may be several reasons why a subscriber would no longer want your emails. It is possible that the subscriber has shifted his focus to another area and no longer wants to receive your emails. 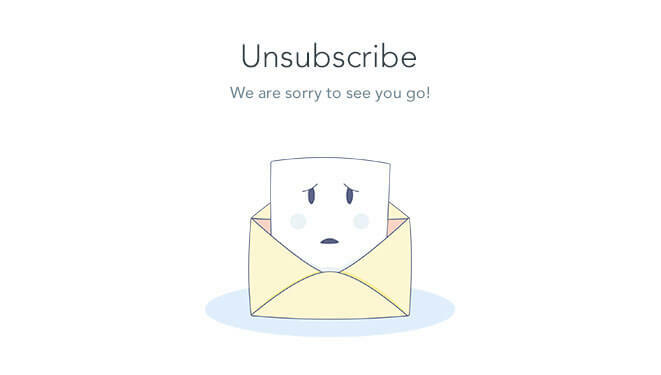 Another reason for unsubscribing is that the user doesn’t remember giving you his email. Finally, it could be so that he doesn’t find your emails interesting anymore. So, when they do unsubscribe, you should ask them a reason. A simple feedback survey (with only one single question) should be sufficient for this. Make sure they’re removed from the email list BEFORE they see the survey. Acknowledged their removal to them in bright colors on the survey page. This is to ensure that the outgoing subscribers are not pressurized to fill the survey. In this chapter, we shared the basic building blocks of a marketing email marketing. We will now talk about a very special technique that allows you to create more products and ultimately contributes to a higher revenue. In further chapters of this email marketing guide, we will also see how to design your own landing pages and what kind of emails to send. All the concepts explained in next few chapters lay the foundation for growing your email list.